Who will be accountable for SMDC housing plans? 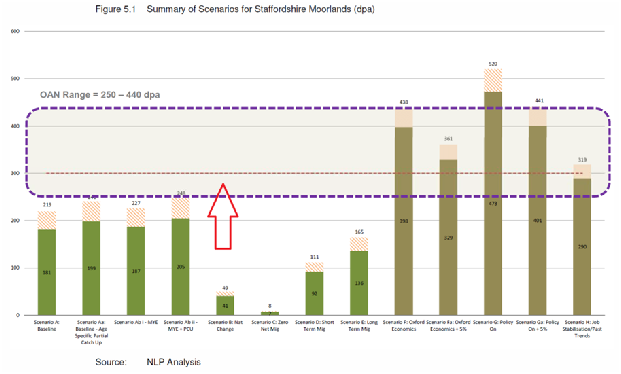 Last Year (May 2016) residents were invited (yet again) to respond to the local plan proposals for housing around Cheadle and the Staffordshire Moorlands. Cheadle Unite submitted a response to SMDC (June 2016 ), the full document is detailed here following feedback from the community . To summarise, last year SMDC chose to ignore the official 2012 Office for National Statistics (ONS) Sub-National Population Predictions projecting a much reduced and levelling off of the population across the Moorlands and also avoided accommodating the latest 2015 Department for Communities and Local Government (DCLG)Household prediction, which translate this reduced population into a much reduced housing requirement of only 2573 dwellings across the Moorlands, Instead choosing to stick with the original 6000+ housing requirement. While not disseminating the above figures, SMDC simultaneously commissioned ‘additional work’ produced by Nathaniel Lichfield Partners (NLP) Jan 2016. This report acts as a mechanism for SMDC to argue for retention of high levels of housing using an Oxford Economics model. An SMDC document titled ‘5._local_plan_development_requirements’ dated March 2016 contains the NLP report (as usual, poorly titled and lengthy in content and words to ‘spin’ an angle). It draws the assertion that due to an aging population, in order to see a net gain of just 85 Jobs through to 2031 it is necessary to secure a net migration of 7,697 people into the area. (section 7.27). The document contains a graph in Figure 5.1 (below) that highlights in brown how the Oxford Economics model data pushes the OAN (dwellings per annum) range well above the level that would exist due to ONS natural local population growth and the housing needs from the 2015 DCLG Housing level predictions (as shown by our red arrow). Despite the very significant voice of the community through numerous consultations and thousands of responses, SMDC continues to pursue the same agenda. In fact we now faces an additional 150 houses taken from smaller villages. Now Cheadle residents recognise our duty to provide a level of housing especially to meet local demand and for our younger generation. However we believe the current strategy is against the wishes of the majority of the community.  The ‘Oxford economic’ model used clearly raises the justified level of housing provision for the Moorlands, but it is seriously flawed in failing to identify how it will ensure that the new houses will in-fact be occupied by working age population. It fails to identify that Jobs will in-fact exist for the new occupants. We estimate that far from solving any contentious working population in-balance it has a far greater potential to in fact exacerbate the problem and increase demand on already over-stretched resources. It fails to identify any potential we already have to address any working population in-balance through for example the increase in the retirement age and increases in the age of our working younger generation before they leave home.  There have been many housing developments in Cheadle Over the last 30 Years. None have delivered any significant infrastructure improvements, be it improved roads, schools doctors etc. All have in effect increased demand on our limited resources. There is absolutely no evidence that this will change when more houses are built especially in the current and likely economic climate.  Questions exist over money set aside for planning obligations (106 agreements) made between Developers and SMDC. Where is this money being spent?  The housing land supply schedule shows that despite 378 proposed developments for Cheadle dating back to 1998 only half have been completed (190). Why are SMDC inflating demand?  Cheadle Unite have repeatedly and for nearly a decade asked SMDC to work with our local City Stoke-on-Trent to ensure development focus and regeneration takes precedent on Brownfield sites around the potteries where affordable housing can be built around existing infrastructure and proven transport links. Not least to protect rural England and our agricultural land. Our valued city has great potential to create wealth for the region as does Cheadle to provide tourism for its beauty and local resources. SMDC continue to avoid working with Stoke-on-Trent while East Cheshire a taking a more collaborative stance.  SMDCs Proposals equate to an annual house build of 300 houses per year. Against a history of 80 houses per year. We don’t believe this is reasonable and is likely to produce huge challenges for our infra-structure, should it occur.  The Chief Exec of SMDC was paid £169,869 + £26,191 into his pension by tax payers in 2014. The current consultation draws on various proposals around Cheadle Mainly in the South North and East. Cheadle Unite will be making a representation to SMDC primarily to again call for a reduction in our planned housing levels (1495), for genuine collaboration with the Potteries and to support our local town and businesses and protect our open and green spaces and agricultural land. However we urge residents to look at how the plans affect their area and using sound and effective arguments and any of the key facts detailed here make an appropriate response to SMDC. Divide and conquer has been an historic SMDC strategy which we must urge residents to avoid. We must stand together. Please do not suggest sites without consent from those who may be affected. However we must highlight why we feel the local plan is floored and demand that SMDC detail who will take responsibility for what is clearly a floored strategic plan when it goes wrong and in what way will they be held accountable. The consultation is only open until 5pm on Friday 22nd September 2017. SMDC have re-scheduled the Cheadle Consultation Drop to the 7th of September 5-8 PM at the Guild hall. This included details of the responses sent on previous SMDC consultations including 2015, meetings with residents, door side conversations, Cheadle Unite committee and MUPAG committee meetings. Including 85 Completions and 244 Commitments.